Issue: If you are using Embedded Visual C++ 4 in Windows Vista or Windows 7, you may face problem cannot create a new project. Cannot cannot select CPUs from the list. Error message when creating new project. Compatibility issue between Embedded Visual C++ and Windows Vista/7. 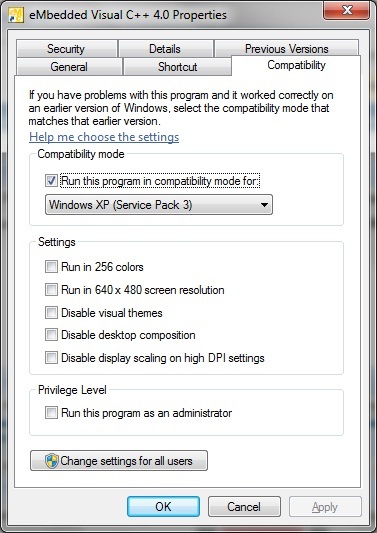 Try run the EVC4 program in compatibility mode for Windows XP. i’m running win7 and i’ve tried several different compatibility modes but the problem is still the same. I found that, as well as setting EVC.exe to compatibility mode, I had to re-install the SDK’s while UAC was switched off. You can switch it back on after they’re installed. After doing this, I have full symbolic debugging, via WMDC on USB, when connected to a WM6.5 mobile phone. Hiya, I am trying to do the same thing but when I try to install EVC SP 4.0 (the latest and greatest Service Pack) the installer runs into an error and doesn’t finish installing the SP4. Which SP do you recommend? Firstly, make sure you have downloaded the installer from a trusted source. eVC4 SP4 is just a service pack but not a full program. 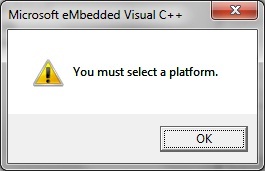 You must install the eMbedded Visual C++ 4.0 first before you install eMbedded Visual C++ 4.0 SP4. Besides, make sure the eVC4 program is not running when you are installing the service pack. 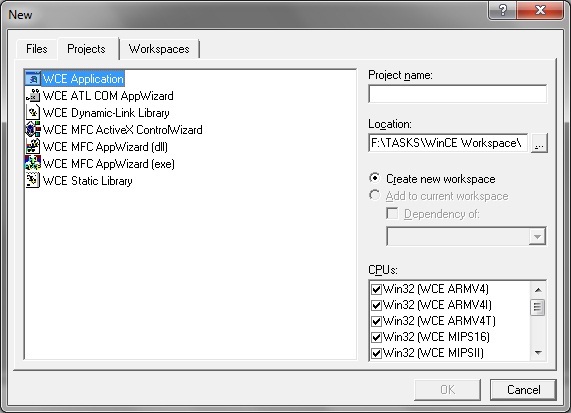 eVC4 SP3 is a merge of SP1 & SP2, for development to target Windows CE .NET, 4.0, 4.1, 4.2. SP4 added support for Windows CE 5.0 based devices. I have the same problems, completely: tried installing EVC++ on Vista 64, followed by SP4; installation is ok, but SP4 gives error, “package can’t be opened”, along those lines. I nstalled SDK for WCE 5.00, that went fine, but when I run EVC++ and try to create a new project (“Hello World” type selected from project setup choices), EVC++ hangs forever. I tried doing entire installation again on WinXP laptop, same result. I tried downloading SP4 from link above and installing – same error message as above. Anybody know what’s going on here? What a time vampire this thing is. The error can caused by several things, most probably it is not a evc4 or user permission issue, but an issue of MSI package in windows vista. on my windows 7 (32bit) machine. Which service pack i have to use. Install eMbedded Visual C++ 4.0 first before you install eMbedded Visual C++ 4.0 SP4. Page to download eMbedded Visual C++ 4.0 installer no longer available on Microsoft website. You can still download the installer from here.